This may look like a long list of ingredients but don’t be put off. 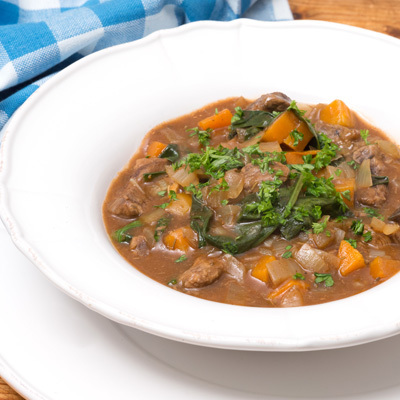 This is quick to put together and certainly worth a place in your slow cooker repertoire. Make this gluten free by thickening with maize cornflour. If serving with rice, try this tip: Add one teaspoon DYC White Vinegar to rice cooking water. This make the rice whiter and grains less sticky. Peel onions and chop finely. Place in the bottom of the slow cooker bowl. Crush peel and chop garlic. Add to onion. Wash and trim celery. Peel and trim carrots. Cut celery and carrots into 1 centimetre cubes. Place on top of onions with orange rind. Mix thyme, rosemary, tomato paste, vinegar, cumin and stock together. Remove fat from meat and cut into 3 centimetre cubes. Place in slow cooker. Cover and cook on high for 4 hours or on low for 8 hours or until meat is tender. Mix the cornflour and water together until smooth. Mix into the meat mixture and cook on high for 10 minutes before serving. Mix in the baby spinach just before serving. Serve with steamed rice, mashed potato or kumara, or crusty bread.